The Enigma of Arrival opens much like any other coming-of-age film—a group of wayward boys tries to impress some girls with antics on a motorcycle. One of these girls, Dongdong (played by Gu Xuan), becomes the center of their attention. Like most wayward boys, the male characters in Enigma try to convey their “coolness” through contempt towards authority. They break school rules, talk back at their teachers—and steal diesel from a local gang to buy a new motorcycle. This last act of defiance is where this otherwise normal coming-of-age story takes a darker twist. After uncovering the theft, the local gang beats up the boys and threatens to do so again, unless they can pay them back for the diesel. The boys decide to take the offensive though, and burn some ships that belong to the gang. Upon their triumphant return, however, the boys discover Dongdong’s bag left a bench, with Dongdong nowhere to be found. The rest of the film then walks back through the events of that night, from the different perspectives of each of the boys. Described by director Song Wen as highlighting “how life can be crushed by lies,” The Enigma of Arrival is filled with suspense and drama—not that kind that will have you on the edge of your seats, but the kind that will make your heart sink when the tragic events that shatters its characters’ carefree youth are revealed. The Enigma of Arrival uses night and day to capture mysterious events and their ultimate revelation, respectively. 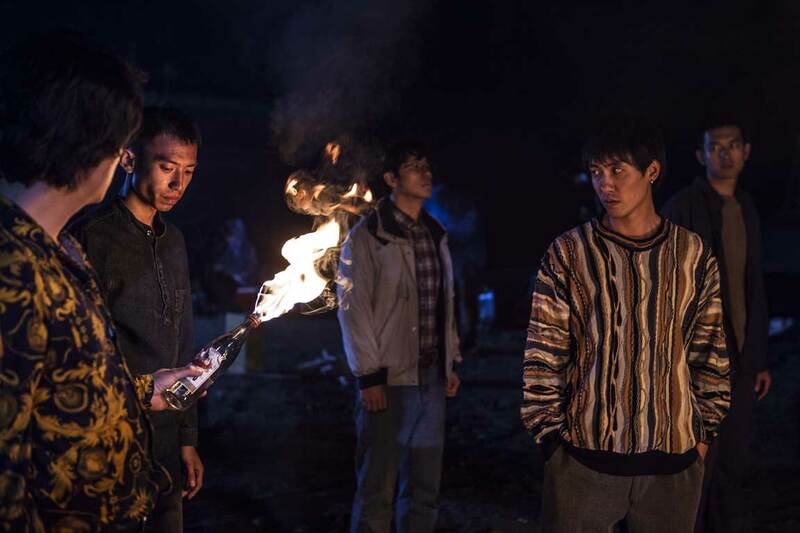 Furthermore, it leverages the contrast of the bleak, colorless scenes of life in an impoverished village to emphasize the depression that the boys go through when they lose Dongdong, against more colorful scenes set in a Japanese restaurant when the truth of what happened to Dongdong is finally revealed. Ultimately though, The Enigma of Arrival is a darker take on the coming-of-age story. Instead of featuring the lively highlights of youth, and disappointing—yet ultimately harmless—heartbreaks, it shows how a series of adolescent mistakes can cause lifelong consequences. The Enigma of Arrival—China. Dialog in Mandarin Chinese. Directed by Song Wen. Running time 1hr 52min. First released October 2018. Starring Gu Xuan, Li Xian, and Liu Wei. The Enigma of Arrival had its world premiere at the 2018 Busan International Film Festival.